A fairly short growing and early flowering species. The bright orange pistils stand out with all varieties within this species. In borders, rock gardens, lawns and under trees and shrubs. Allow the foliage to die back naturally and they will grow back and bloom for many years to come. If you want them to naturalize successfully in your lawn you should not cut your lawn (or mow around them) for several weeks after flowering has finished. 'Bowles Variety' (white), 'Firefly' (light blue with yellow center) and 'Ssp Tricolor' (pastel purple, white and orange-yellow center). Cultivation and harvesting of crocuses was first documented on the island of Crete in the Mediterranean. 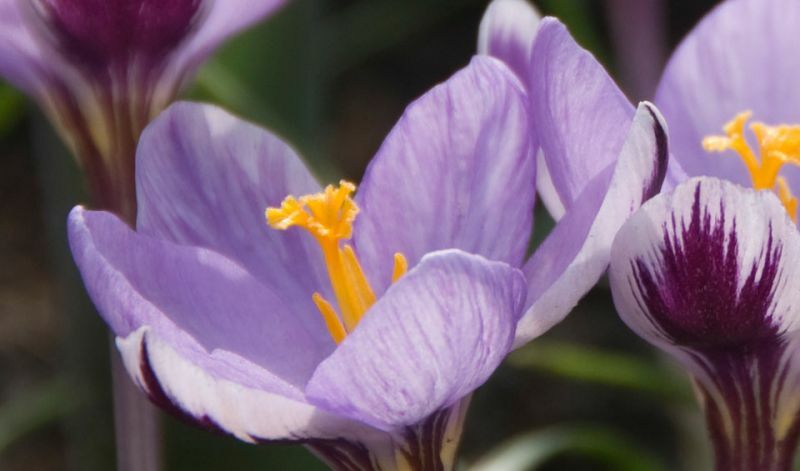 Crocus are native to woodland, scrub and meadows from sea level, to alpine tundra in central and southern Europe, North Africa and the Middle East, on the islands of the Aegean, and across central Asia into western China. The first crocuses seen in the Netherlands, where they are not native, came from Constantinople in the 1560's. A few ended up with Carolus Clusius in the botanical gardens in Leiden. By 1620 some new varieties had been developed that are very similar to ones still being traded today.